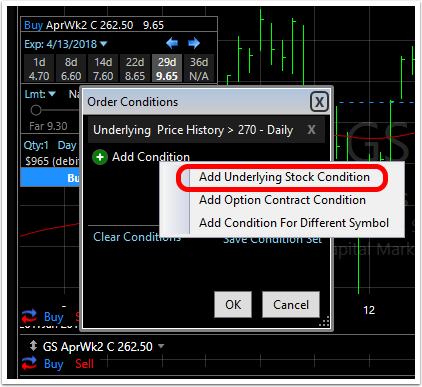 Using conditional orders, you can place an order for a single option which is triggered by a condition met by the underlying stock. 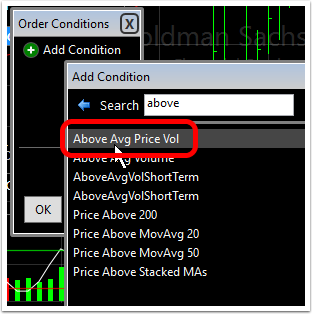 (Note: conditional orders can only be used on single options, not multi-legged options strategies.) 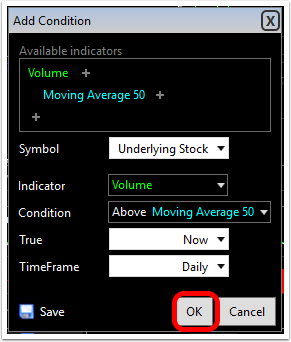 Here are the steps for triggering an option order based on a condition or condition set applied to the underlying stock. 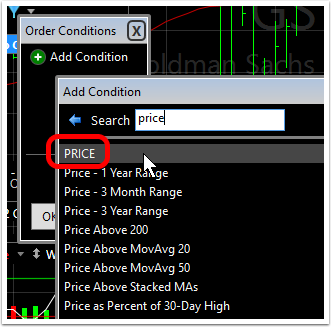 Click the option button at the bottom of the chart price pane. 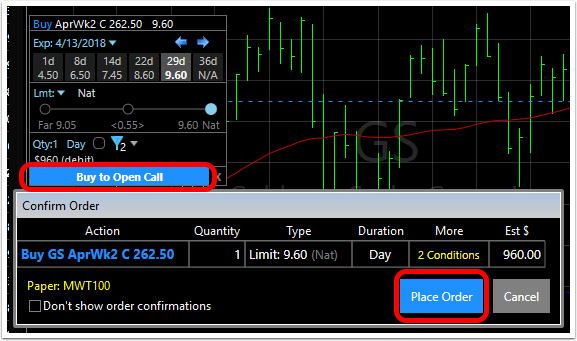 Note: Conditional orders can also be set on Short Put, Long Put and Short Call orders. 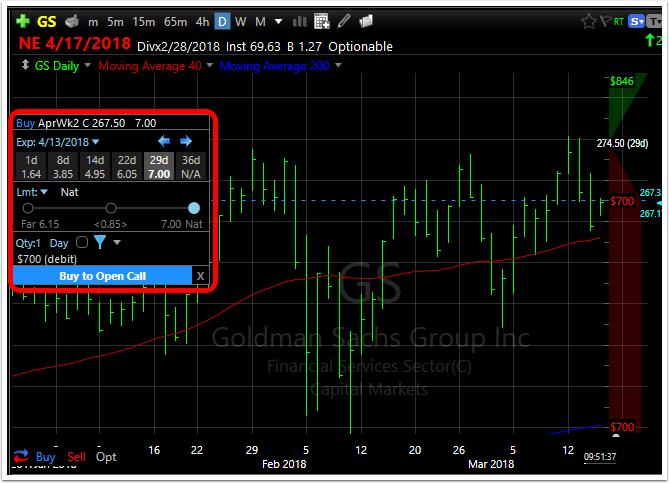 This places an on-chart order ticket for a long call on the chart. Alternately, use the blue arrows to move through the grid of available Expiration dates. 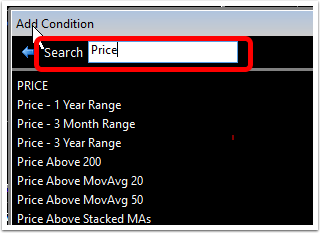 Using the Trade Slider, click and drag the Strike Price line to the desired strike price for the chosen Expiration date. 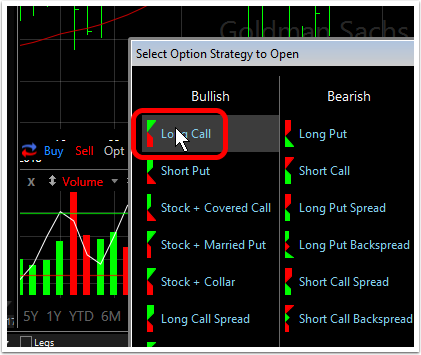 Strike prices are represented by the hash marks near the green and red chart P& L zones. 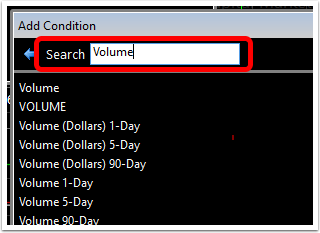 In the Search field type the name of the condition(s) to be used for the Order. 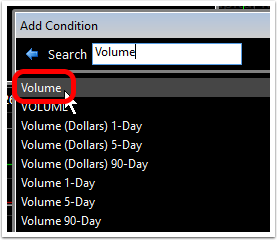 Note: In this example we will build a Condition set looking for stocks with Price reaching a certain level on above Average Daily Volume. 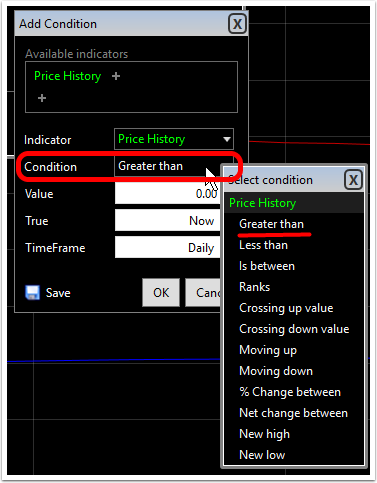 However, any indicators, fundamentals, formula, etc., in the condition criteria library can be used for constructing a condition/condition set. For more on creating conditions, click here. 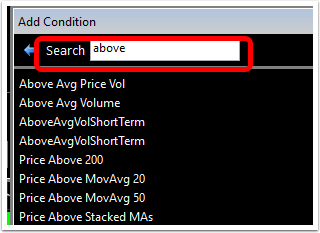 Click the Condition dropdown and select Greater Than from the list. Set the desire value (e.g. 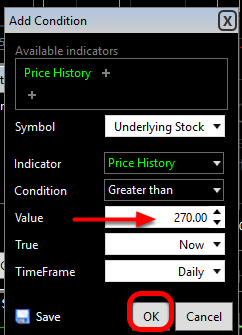 above 270) and click OK.
Click Add Condition to create a second condition. 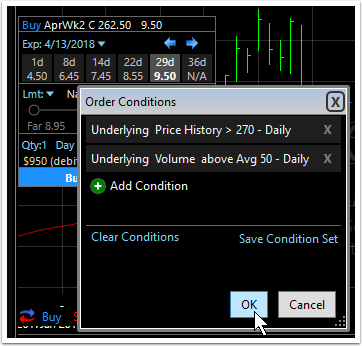 You can use multiple conditions (a Condition Set) to trigger an order. 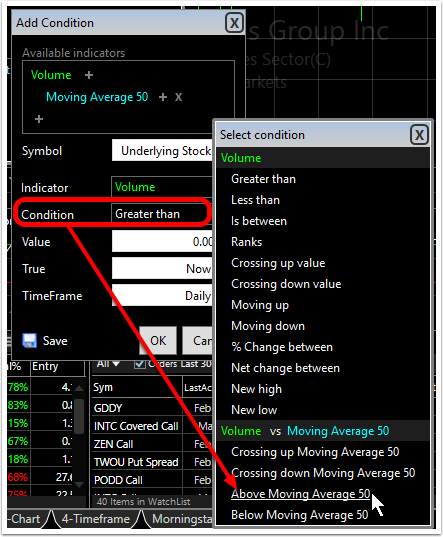 Select Add Underlying Stock Condition to build the condition based on the underlying stock (not the option itself). 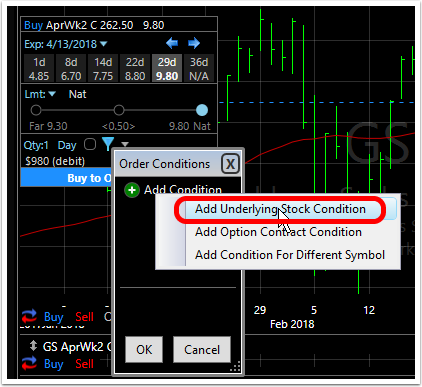 While this example is creating conditions only on the underlying stock, you can mix conditions based on the underlying, the actual option itself and even using a different symbol all together. 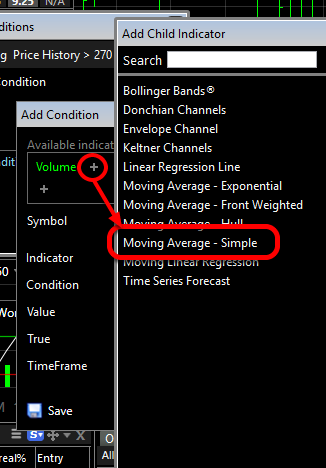 Add a moving average to Volume (using the plus sign next to Volume). 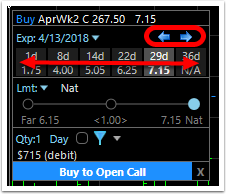 Click OK to add the second condition. 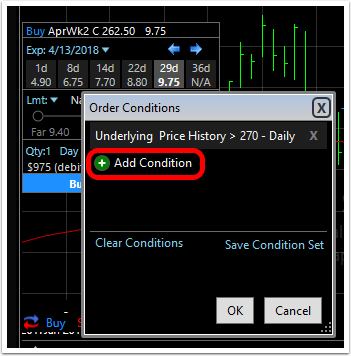 Click OK to Add the conditions to the order ticket. 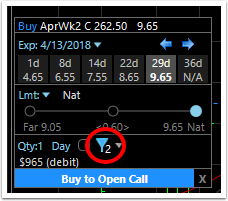 The conditional order icon (blue funnel) will now show a number next to it (in this example, 2). This is the number of conditions involved in the conditional order. 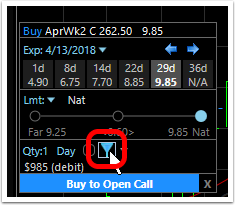 Click Buy to Open Call and then Place Order on the confirmation screen when it appears. 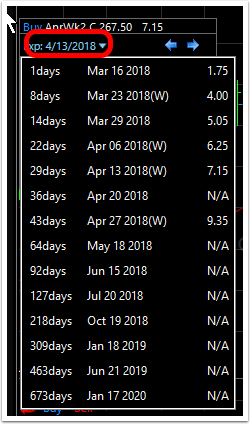 The order now appears on your chart. 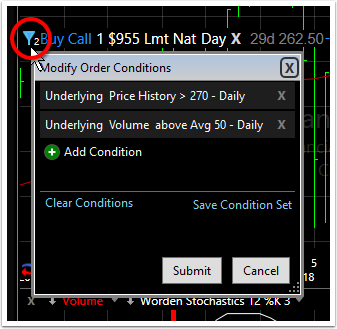 The conditions are noted by the condition icon (blue funnel) with the number of conditions next to it. 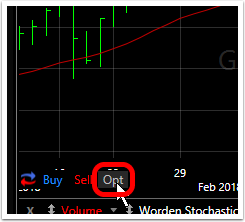 Only when the conditions are met--the stock reaches $270 on above average volume--will the order be placed. 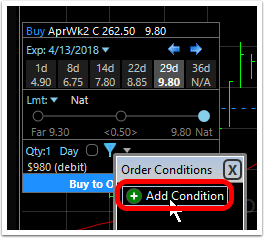 You can edit the conditions in the live order by clicking on the condition icon (blue funnel) and then selecting/changing the individual conditions. 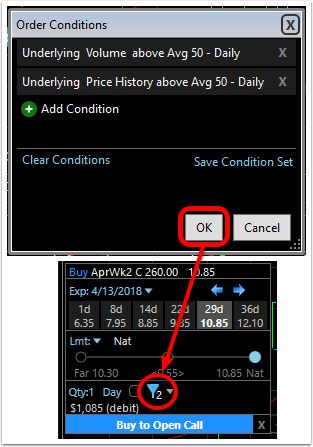 Submitting any edited conditions will create a modify order ticket and will actually modify the existing order based on the new condition parameters. In the Search field type the name of an existing Condition or Condition Set to be used for the Order. Select the existing Condition/Condition set to be used. Follow step 5 to place the order. 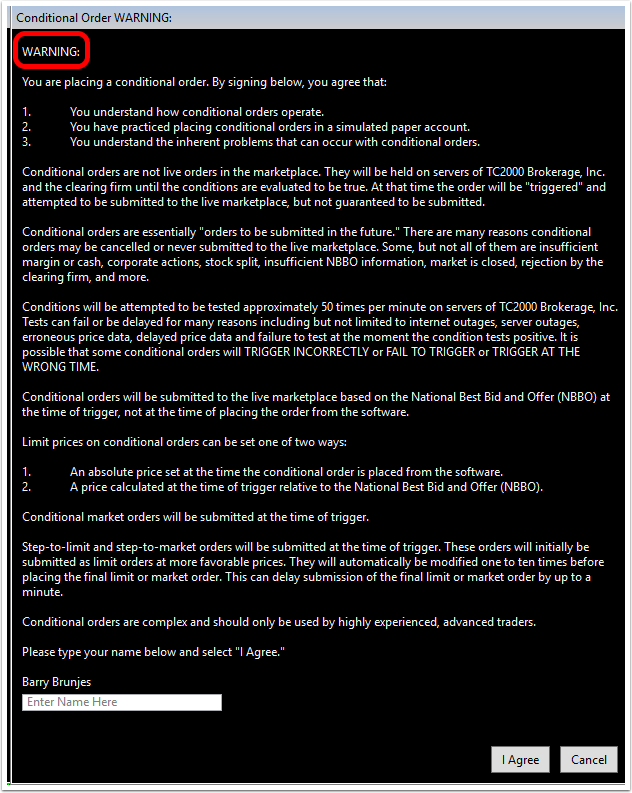 Disclaimer: Please note, because of the unique nature and many details in a conditional order, whenever you use any conditional order you will be prompted with the disclaimer explanation seen here. It is important to read and understand the implications of using conditional orders.